Had a very enjoyable day trip to Hull City v Blackburn Rovers on Saturday. Another 0-0 draw, but a decent performance lay at the centre of it. Nicola Kalinic gets into some great positions and must score soon, or he'll end up next to Corrado Grabbi on here. All the midfield players had chances galore to blast in a shot, but seem to be looking for the perfect pass. It's where David Dunn is so effective, so his recovery would be welcome. Away trips are about more than just the match though. Me and my pal Steven got a chance to catch up on this and that without wives or kids in tow. We took the train over and had a look around Hull; finding a decent piece of haddock for lunch, which you'd expect at the seaside. Hull's German christmas market is really just a dressed up car boot sale and tatty market, but it's nice they're trying to make an effort. I'm still not drinking so I probably ruined Steven's day by keeping us out of Wetherspoons. It was also the 127th ground on which I've watched football and was a rare day out for the flag (pictured). There was plenty of noisy banter and solid support from the 1500 travelling fans. I'd say 5 per cent are total cretins; real neanderthal dingbats who boo Keith Andrews before he's even taken the field and sing the most offensive and racist songs imaginable about Owen Coyle. A further 20 per cent are just young lads who are easily led. 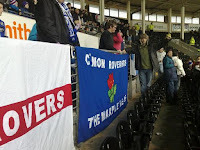 The remainder, that is most Rovers fans, are quite nice people. But it does mean there's a good chance you'll get a nutter in your orbit at a reasonably well attended away match and there isn't anywhere to move to. One idiot, who I recognised from home games, stood up throughout, without a thought for the young lads behind him. No-one asked him to sit down, not even a steward. It was like he was willing anyone to challenge him. We suggested to the teenage lads sat behind him that two seats on our row were empty and that they'd get a better view. They seemed very relieved. As a parent the question then is do you want your kids subjected to louts standing up in front of you and coming out with this rubbish. I'd say not yet, but that's life.